"In Sakuran, Moyoco Anno lifts the veil on life in the Edo period pleasure quarter, Yoshiwara. The story follows Kiyoha, sold into a brothel as a child and forced to work as a maid and her rise to prominence as one of the top-ranking courtesans in Yoshiwara. The allure of the “flower and willow world“ as it was called by artists in the day is underscored by the very real tragedy, heartbreak and difficult lives led by those seemingly glamourous courtesans. Will Kiyoha’s fox-like wiles give her a chance to break free of her gilded cage? Or will her fighting spirit ruin her chances of ever escaping the brothel?" I've been a fan of Anno Moyoco's quirky, sensual manga ever since Tokyopop and Viz experimented with English versions of her longer works Happy Mania and Flowers and Bees. In the absence of any more English language books, I imported and watched the Sakuran live action movie when it was released on DVD (it's since, incredibly, received a UK DVD release). The movie adaptation had me spellbound - between the perfectly-cast Tsuchiya Anna in the lead role, a memorable soundtrack from Shiina Ringo and luxurious visuals, it was like watching a fully-realised work of art. The storyline is simple and a few anachronistic elements will certainly frustrate some viewers, yet the movie was never trying to be a classic period piece. Instead, it's a surreal look at the everyday lives of women who have been traded like possessions and forced to earn their keep in the walled world of Yoshiwara. Despite a thick veneer of glamour, the story shies away from nothing. The movie left a strong impression on me long after the credits had rolled. Having assumed that the manga would never be picked up for publication in the US I was delighted to finally be able to add it to my collection last year. Reading the manga after the live action movie is slightly disorientating as the film spends far more time on the lead character's adulthood than the original story. The story completely diverges towards the end, and consequently, the two versions of Sakuran feel very different. I was ultimately left with the impression that the Sakuran manga, richly steeped in suffocating femininity, has a much stronger message than the movie. The protagonist (she goes by a number of different names over the course of her career) is extremely likeable; a spirited young lady in challenging circumstances through no fault of her own. She's perpetually having to balance her rebellious impulses with the pressures unique to the alien world in which she's been forced to live. Anno's artwork is nothing short of sumptuous. Her gaudy, expressive art style matches the subject material perfectly. Intricately detailed fabrics, hairstyles and make-up fill every panel. My favourite character, visually, was the oiran Mikumo. Her unreadable face had a stoic beauty to it which made her resemble a woodblock print brought to life. Sakuran has been blessed with a top-quality English language release from Vertical. It's a little more expensive than a regular book, but it's self-contained and much thicker than normal too. There are some translation notes at the back to help make sense of the exotic terminology used in the pleasure district and the cover is stunning, placing Anno's garishly beautiful illustrations over dazzling coloured foil. This is easily one of the most striking books in my collection. 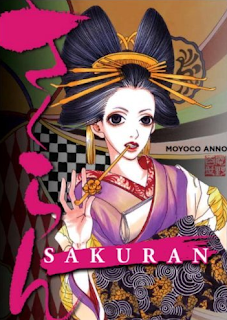 I would recommend Sakuran to anyone who wants to see traditional Japanese courtesans from a slightly different, less idealised perspective - so long as the 18+ rating doesn't frighten them away. Nico Nico Douga: Hello, 2013!